A week after canceling the 2015 edition of Camp Hapitok amid a dispute with county officials, organizers have announced that the sleep-away program for youth with speech disorders will take place this summer. Last week, Friends of Hapitok announced that a dispute with the San Luis Obispo County Office of Education led to the cancellation of the camp’s 45th year of operation. Camp organizers said Superintendent James Bresica informed them that the county would no longer provide funding and a facility for the program. The county cited legal liability as the issue, and Bresica said the office of education would have to assume control of the camp if it were to keep funding the program. Friends of Hapitok President Marie Larsen said the county’s demand left camp organizers in the precarious situation of raising $80,000 by summer. But, Larsen said in a press release on Tuesday that Bresica decided to let Hapitok continue using the camp facilities free of charge. Bresica made the announcement at a county board of education meeting last Thursday. Friends of Hapitok is committed to raising $55,000 for 2015 operations and seed money for the future, Larsen said. A 60-day crowdfunding campaign is currently underway. 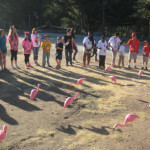 Camp Hapitok is a four-week program for Central Coast elementary school students who have speech and language impairments. Campers have historically attended the program free of charge. My son who is deaf went to Camp Hapitok for five summers when he was a little boy, I can say it helped him become the man he is today. It was a life changing time in his life and his family. I am so happy that it will continue. I have the fondest memories of Camp Hapitok, it was a very good time in his (and mine) life that we will treasure forever. Please support this program any way you can! All of our families need help from time to time and those with special needs are truly grateful for any help that can be provided. Thank you. This ia also why we need to be careful to not, in this case, burn the new County Superintendent at the stake, upon hearing the initial news the program was cancelled. I can see the new guy stepping in, looking everything over, getting legal advice the COE was vulnerable legally and protecting the entity he works for. When it boiled down to a matter of charging money or not, he waived that, and we now see truer colors of who this new Suoerintendant might be. What, restrain judgment? This site is for people to pass quick and final judgment on every issue and person in the news. Nuance and subtlety be damned! The world is black and white. This is very good news and I agree with you CentralCoastRN, my faith in humanity is lifted as well. This is a benefit that pays for itself. Children are the truly innocent in society, and this is a service that middle class taxpayers actual can receive and deserve! I have actually seen this help children in remarkable ways, unlike other useless programs. Thank you, thank you, thank you!